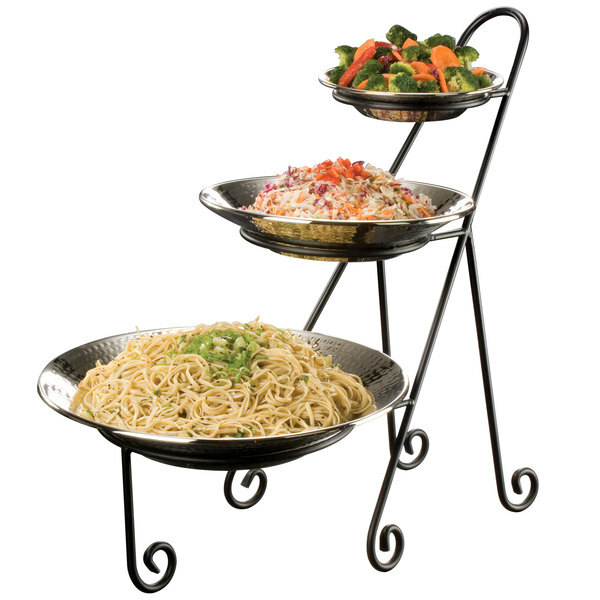 Easily display appetizers, baked goods, or other tasty treats with this American Metalcraft IS15 Ironworks three-tier round display stand with curled feet. With its three-tier design, this stand requires a small footprint, but accommodates multiple plates of displayed products. This is convenient when space is limited, such as on buffets or at catering events with few tables. For added convenience, this display stand holds a variety of American Metalcraft servers (sold separately). Confidently display your creations or products on the stand, thanks to its sturdy design and durable wrought iron construction. The wrought iron provides the stand with convenient heft and weight, helping to stabilize it and your display, as well as ensures that it'll withstand transport and countless events with ease! Plus, the black wrought iron construction of this stand also adds a bold, rustic, aesthetic touch. It's perfect for buffets, parties, farmer markets, and countless other occasions where you need a practical, but stylish display piece. Great piece that we use for our Sunday Brunch buffet. Solid as heck and a nice addition to the "look" of the buffet. I love things with height so this really was useful. My only wish is that it listed the size bowls to use as it was quite a task to find the right ones for each step.